In a city densely packed with eye candy over a wide area, it was hard to pick favorite spots. I chose the Hradcany (Castle District) as my fave, but the Old City — the Staré Město District on the east bank of the Vltava — came a close second. Prague’s Old City was simply incredible, block after block of gorgeously restored buildings, huge market squares, and souvenir shopping like nowhere else I had seen. What both amazed and disappointed me was that the first time I went to Prague, I missed this district completely and spent all my time on the west bank. That was probably because the Castle District was so visible from the river, while the Old Town was not quite so evident. This chapter covered the east bank of the Vltava River from the National Theater (Národní divaldo, first photograph) to the Cechův most, the bridge at the north side marked with massive yellow columns at each end, then eastward to the Prašná Brána (or Powder Tower). 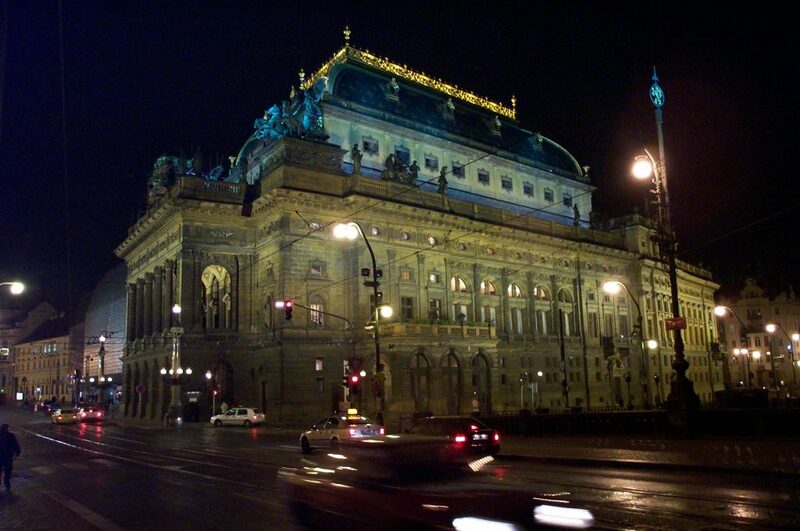 My first visit to Prague was on a sunny September afternoon in 2000, and I started along the east bank right at the National Theater. The Theater was really impressive, despite being still a bit grungy (probably black soot not quite cleaned off). It was cleaned up even more since and looked brand new in November 2002, especially the roof. This original stone theater was adjacent to a modernized entertainment complex that you can glimpse just to its left. Both were constantly busy with classical music concerts and shows, catering to the upper crust. On the other hand, the rest of the east bank catered more to the tourists. The Smetanovo roadway followed the east bank to Charles Bridge from several meters above water level. Stairways leading down the bank provided access to a number of outdoor cafés (many in which were submerged during the 2002 floods, and some of the water damage could still be seen). These were economy cafés compared to the ones in the Hradcany or Malá Strana districts, but they were doing great business and the help was very friendly. Further along the east bank, I reached the Karlovy lažné (Charles Bathhouse), which is a square jutting out over a log dam near the Charles Bridge. On the square were more economy cafés overlooking the dam and a market passage loaded with budget souvenir shops, especially crystal. I emphasize the word ‘budget’, sort of. Those stores were geared for the mass throngs of tourists that congregated on the Charles Bridge who were eager to shop quickly. My opinion was that those stores provided lower quality (but still quality) items at prices that were not proportionally lower to the better shops elsewhere in the city. My advice would be to seek out the better shops in the main market square or in Malá Strana. The passage and its surrounding area was also where the bulk of the nightlife could be found. Several nightclubs and bars operated there, clearly the type to attract the younger, more active (or more rowdy, take your pick) crowd. It was the type of activity that, at my age, I avoided, so I cannot pass along any opinions of the nightlife. The square (Staroměstske namesti) is shown in the second photo, and was the type of place I could stand and stare at forever! The square must have been several soccer fields large and surrounded by some of the most incredible architecture I had ever seen! 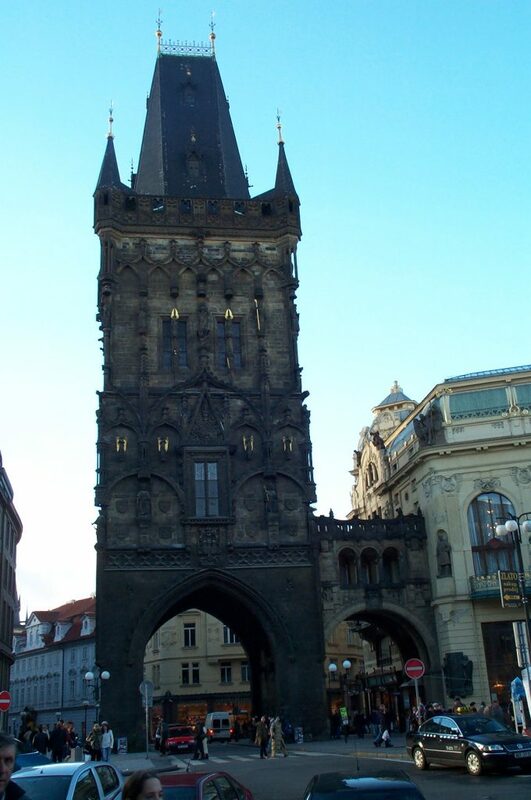 The featured structures in the second photograph included the Tyn Church (před Týnem), the twin towered church lording over the east wall of the square. In front of it was a massive sculpture in honor of John Huss, who preceded Martin Luther in standing up to abuses in the Catholic Church only to be hanged (which was why Luther’s trip to Worms in 1521 was done so under the accompaniment of a large army). As the photo showed, the buildings surrounding the square were brightly colored and elaborately decorated. The large, extraordinarily building behind the Huss sculpture was an art gallery, for example. The third photo shows one of the more exquisite storefronts from up close. Note the detail… amazing! On the opposite of the square were more structures of note. 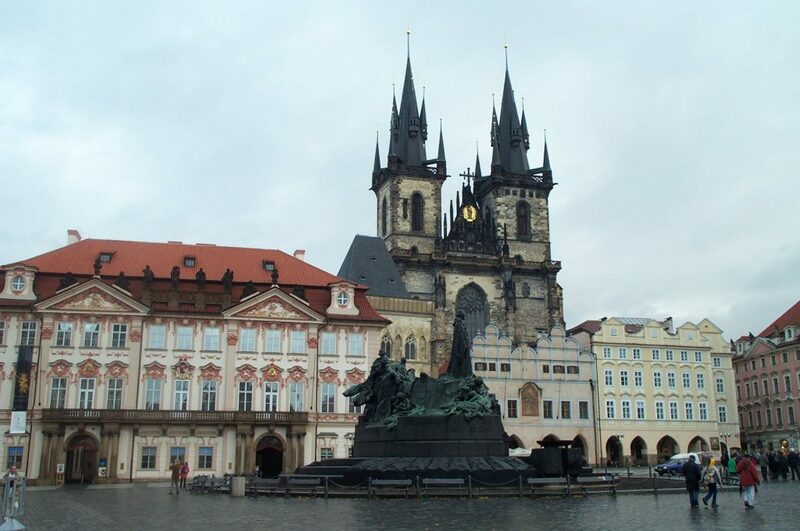 The northwest corner of the square was dominated by St. Nicholas’ Church, that like many of Prague’s churches hosted concerts daily in the late afternoons. I found it to be a common sight to see old ladies selling tickets to the concerts in makeshift booths outside the church entrances. In the southwest corner was the towering Old Town Hall (radnice — rahd-NEET-suh), that also hosted the current-day Tourist Information Bureau. The Town Hall was a classic square-towered building that visitors can now climb for a panoramic view for a small fee. The Bureau was predictably huge, with multilingual workers at the ready for extended working hours. The Bureau not only had just about every tourist service available, it also had its own art gallery with special exhibitions that cost only a few crowns per visit. 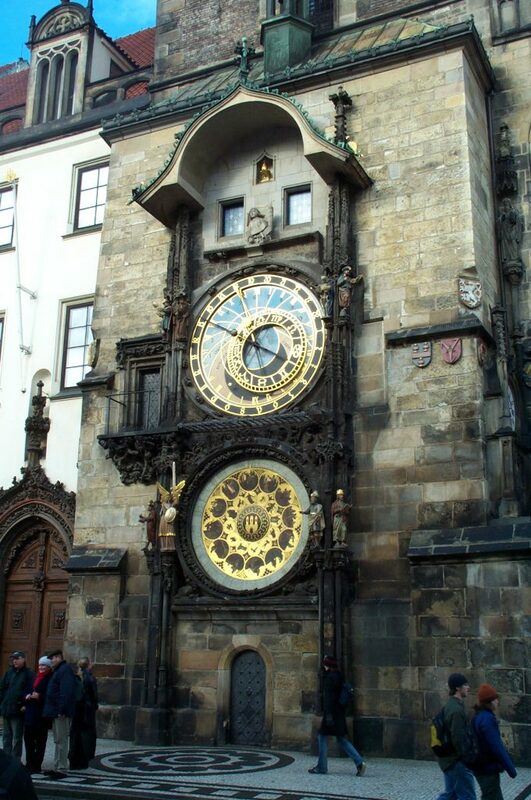 Also, note the fourth photo — it shows the Orloj (OR-loi), an astronomical clock that is mounted on the side of the old Town Hall. The Staronová Synagogue in the Jewish Quarter just to the north of the square. The Minority Convent (Konvent Minoritů), which was a bright white church with beautiful sculptures on the outside. A colonnade (that I was unable to identify) somewhere just east of the square that still had its original frescoes (faded). I saw it and wondered if a restoration plan wasn’t in the works. And finally, the Prašná Brána itself (fifth photograph), the gateway between the Staré Mesto and Nové Mesto. This tower was also an observation deck available to visitors for a small fee. 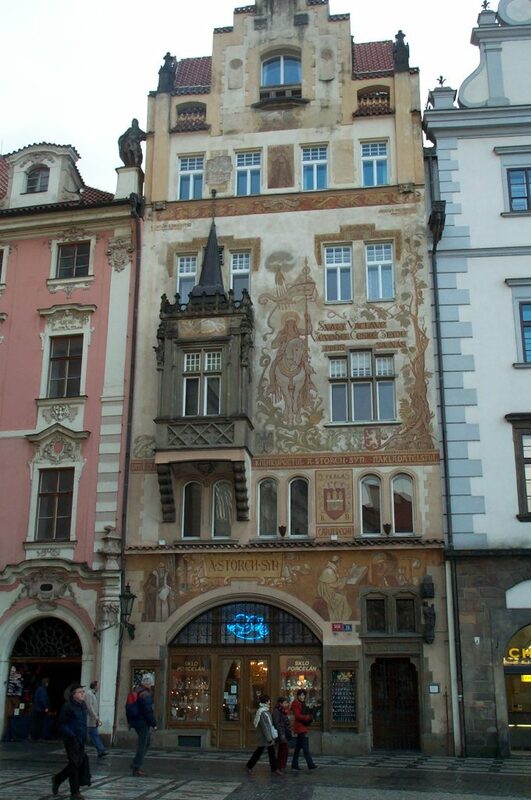 From the photos, it was easy to see why I really enjoyed the Old Town of Prague. I could easily have posted any number of gorgeous shots from the 130 or so I took of the city, but I realize not everyone out there has a cable modem connection. I guess that means you should go Czech it out (guffaw!) for yourself!